CHI St. Alexius Health’s volunteers are present in almost every area of care. On a daily basis, 18 compassionate individuals from the community volunteer their time to greet and assist patients and visitors. Additionally, they deliver flowers and cards, assisting various departments with special projects, helping the nurses make instrument packs, amongst other activities. “We are fortunate to have a dedicated and enthusiastic group of volunteers. Every day of the year, volunteers of all ages and backgrounds contribute their time and skills to make life better for our patients, families and visitors,” stated Tanya Ohlheiser, coordinator of volunteer services. 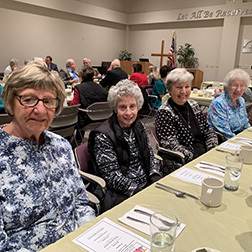 “The extra care and services our volunteers provide contribute to the healing environment of CHI St. Alexius Health.” Since the opening of the original hospital, volunteers have contributed millions of dollars to the hospital and its related programs and millions of hours of volunteer service. At the luncheon, volunteers were treated to a meal and door prizes. CHI St. Alexius Health President Kurt Schley gave an update on various activities going on within the medical center. CHI St. Alexius Health has a long history of volunteerism. Today, the program is continually expanding to accommodate volunteers of all ages including a junior volunteer opportunity for young teens, along with pet therapy. For information on volunteering at CHI St. Alexius Health, call Tanya Ohlheiser at 701.530.7159.